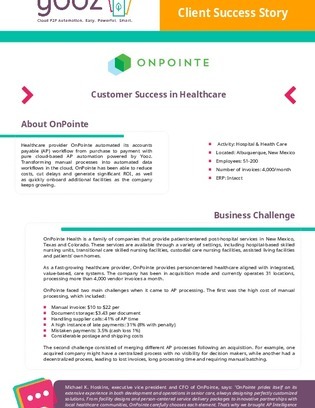 Fast-growing healthcare provider, OnPointe, struggled with the high costs of its manual accounts payable (AP) process. In this case study, learn how OnPointe quickly and painlessly automated its time-consuming manual AP process. Review other business challenges from OnPointe, and explore the benefits of a cloud-based AP automation platform from Yooz.